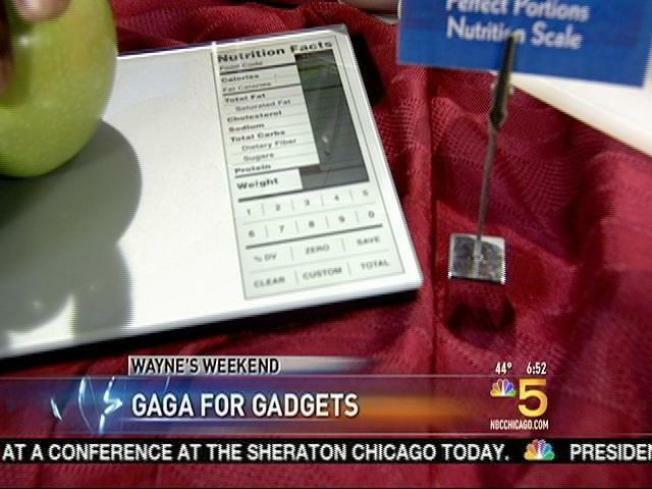 Wayne shares a number of kitchen gadgets that make food prep more fun and a lot easier. Gadgets are designed to make our lives a little easer. When it comes to the kitchen, new tools and products can simplify the preparation process or take the hard work out of repetitions tasks. They can also be fun to use. Here’s a collection of gadgets that are quite useful and would make a nice addition to any kitchen. Whenever possible, with each item, I included the price and purchase information or the link to the manufacturer. The Capresso Froth PRO is designed to create thick and rich frothed milk for cappuccinos, steamed milk for lattes and frothy hot chocolates. It's fast, got three temperature settings and is easy to clean. This pepper mill has a slim and sleek design that complements its precision grinding to make adding flavor easy and stylish. A light on the bottom softly shines on food during the grinding process so you can watch the flow of flavor. Saving money and food has never been easier. This cordless, rechargeable handheld vacuum system is designed to extend the life of ready-to-eat foods. It’s also a great way to keep homemade holiday treats fresher longer. Enjoy fresh baked, delicious cupcakes or muffins in about 10 minutes with the Sunbeam™ Cupcake Maker, baking up to six regular-sized cupcakes at a time, with or without paper lines. Warm up and ready lights indicate that the cupcake maker is on and heating. The easy-lift handle ensures safe handling and non-stick plates make clean up a snap! Each 18-ounce can of Batter Blaster makes approximately 28 four-inch pancakes or eight waffles in minutes. Batter Blaster uses high-quality USDA-Certified Organic ingredients and is also a certified kosher product. The propellant in can contains no ozone-depleting CFCs and the cans are made of recyclable steel. Where: various retailers and www.batterblaster.com. This nutrition scale weighs your food and shows nutrition information though a built-in database containing nearly 2000 foods listings. The easy-to-read nutrition facts are automatically adjusted to your portion size. The ship’s saucer section is replicated by the cutter’s 4” diameter steel blade. The 4.5” handle mimics the warp nacelles and generators. It’s the stainless steel pizza cutter that lets you boldly cut pizza like no man has cut before. You can easily take this quick read thermometer from tailgate to home to studio to wherever you need. It provides an instant reading in less than 6 seconds. To find other kitchen gadgets, check out the book "GADGET NATION: A Journey Through The Eccentric World of Invention" by Innovation Insider Steve Greenberg. Its a fun read showcasing more than 100 quirky gadgets and the inventors behind them (www.gadgetnation.net). The “garage inventors" of Gadget Nation are a slice of Americana. These inventors are chasing the American Dream--risking their 401K's, second mortgage on their home, the kids' college fund--all working to turn their gadget idea into a consumer success. Gadget Nation is NOW in PAPERBACK and available as an eBook.